Are you looking at the ways to display Indian Rupee symbols on your blog or website? Then you are reading the right post. This is the most easy and glitch free method to display Rupee symbol. All you need to do is to add reference to WebRupee’s CSS file and use a span tag with class set to WebRupee to display Indian Rupee font. In detail.. Seems to be more easier than the earlier method right? But hold on. There is a glitch in using this. So in order to display Indian Rupee symbol across the browsers without any issues, we recommend you to go with CSS method. Developers of WebRupee emailed me with the details of why IE is shows a security error. We would like to mention that our both the methods are safe. The article writer faced the security message because he was running webpage in his local computer(as i could figure out from the screenshot), as the script connects to our website and gets the information, it requires internet to connect, and Internet Explorer security strictness causes popping of that security message. A local page has an external link(our link). That external link is bringing some data. That data is changing the Rs to rupee symbol. Internet Explorer thinks this can be a threat. There would not be any such issue once the webpage is run on a server.Try running your webpage in a local web server. You definitely wont face that security issue. 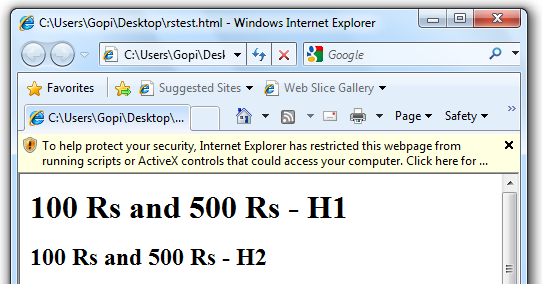 So IE does not show the security error when the pages are served from a web page. Good. Thanks Meher Ranjan Howji and Aman Kumar Jain of WebRupee.com for providing us a simple and cross browser compatible way to display Indian Rupee symbols. Its not working on anchor tag.